TALKS in Downing Street between the North’s First and deputy First Ministers, Peter Robinson of the DUP and Sinn Féin’s Martin McGuinnes, and British Prime Minister Gordon Brown on the transfer of justice and policing powers took place at Downing Street on Tuesday after meetings at Stormont on Monday. Martin McGuinness has said the negotiations are at a critical point. “It’s at a critical point but I believe all this is doable,” he said in London on Tuesday. “I’m more convinced of that now in the aftermath of the meeting today,” he added. 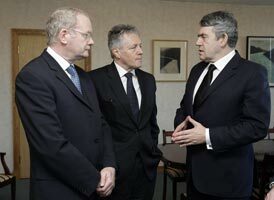 On Monday, Gordon Brown held a series of meetings at Stormont on the issue. Martin McGuinness and DUP leader Peter Robinson held separate talks with the British premier. Sinn Féin President Gerry Adams said earlier this week that stalling by the DUP on the transfer of policing and justice is “contradictory and confused”. 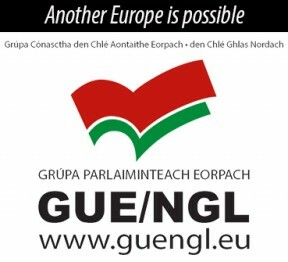 “The transfer of policing and justice powers has become a political football within unionism. The unionist parties are now cynically vying with each other as they seek to win a tactical advantage over political opponents”, he said. The Sinn Féin leader said that “positive leadership” can secure an acceptable financial arrangement and create the conditions for the speedy transfer of powers. “This, in turn, will restore confidence in the political institutions and provide a positive climate for inward investment and the necessary fightback on the economy. A failure by the DUP to deliver on this issue will be a failure for their political leadership. It will encourage their political rivals in the TUV and UUP to set the political agenda for unionism. “Political parties need to be about creating the conditions which tackle crime and the causes of crime. We need to protect the victims of crime while guaranteeing that criminals will be pursued relentlessly and successfully within the law. “All the political parties have agreed to construct local policing and justice arrangements to achieve this. Recent years have seen significant progress made on most of this. But the key development necessary to lock down the reforms that have been made, to ensure democratic accountability, and build on the changes that have occurred, is the transfer of powers on policing and justice. This includes a locally-accountable minister to make informed decisions based on local experience and need. “The police support the transfer of policing and justice powers. Last year, the DUP agreed a process which would deliver this but, until now, the necessary political will to complete that process has been absent.